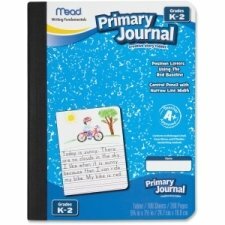 Primary Journal features 100 sheets with a blank space for drawing over seven lines for writing their compositions. Use for creative writing exercises especially for stories because students can draw pictures on the same page. Early creative story tablet has redline cues so students can sit their letters on the baseline. Narrow line width allows optimal pencil control. Journal conforms to Zaner-Bloser, McDoughal Littell and D'Nealian handwriting methods. The inside front cover includes a manuscript and cursive alphabet. Durable cover as secure-sewn binding.